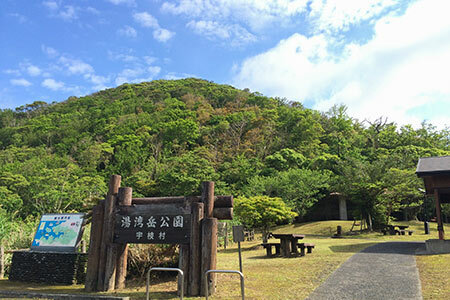 Kinsakubaru Virgin Forest is a popular tourist attraction in Amami. 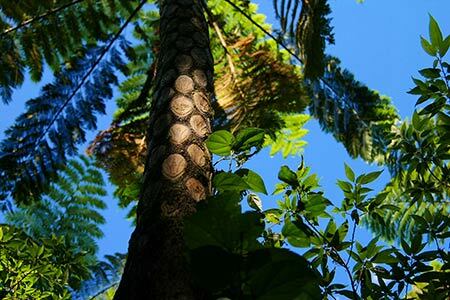 The majority of the area is covered by native forests, which contain 100-year-old Chinese guger trees. 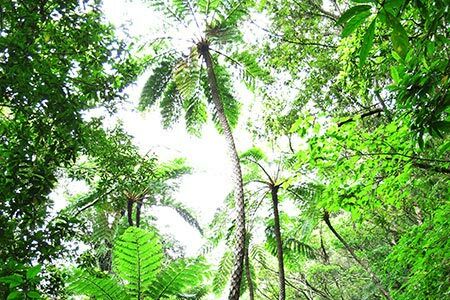 Gigantic ferns create an eerie, mysterious atmosphere; it's no wonder that part of an early Godzilla movie was filmed here. The primordial appearance of the forest makes visitors feel like they've gone back in time. 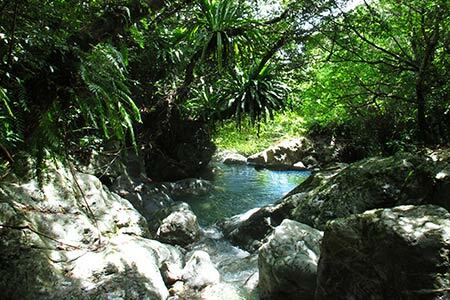 Nature lovers will enjoy seeing precious plants, birds, insects, amphibians and reptiles. 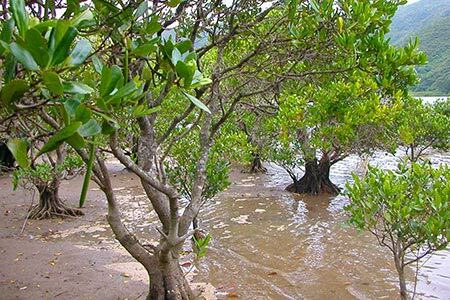 Two rivers flow into Sumiyo and merge, mixing with saltwater from the nearby sea to form a swampy environment that is home to the second largest mangrove area in Japan. 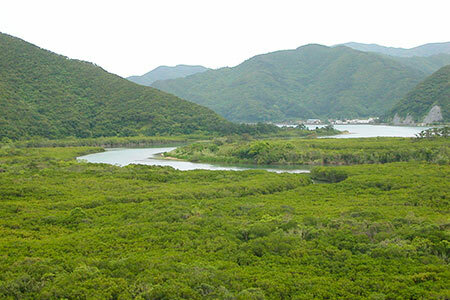 The Virgin Mangrove Forest is one of the most popular tourist attractions in Amami. 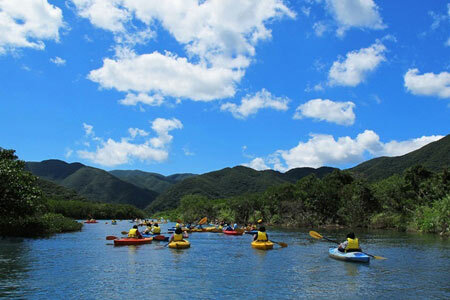 Visitors can kayak into the mangroves and learn about their complex ecology. 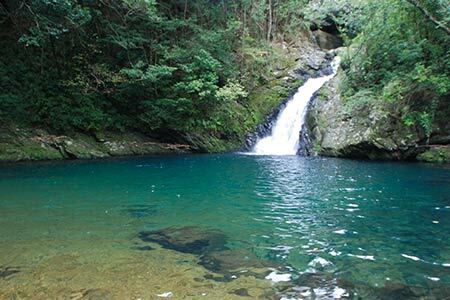 At the foot of Yuwandake Mountain (the tallest mountain in Amami), this nature park includes over 50 acres of native forest. 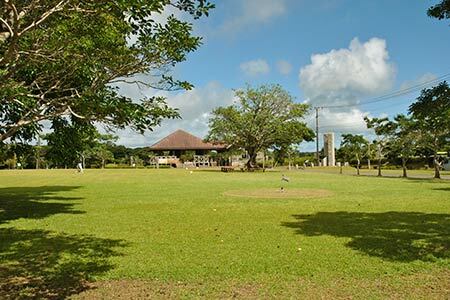 The area is divided into three zones-an athletic field, a coastal area and a mountain stream. 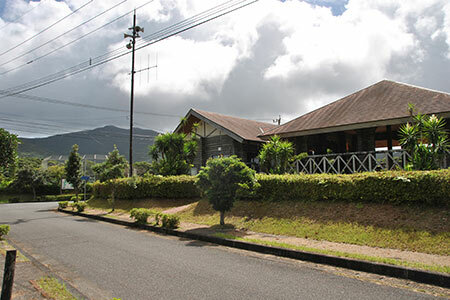 Families often bring their kids to the campground and stay in wooden bungalows or tents. 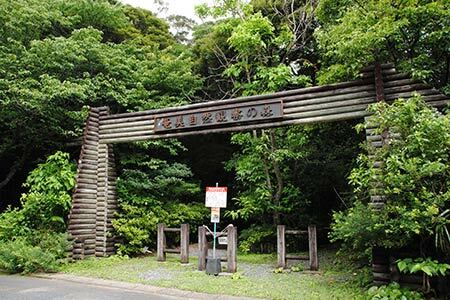 They can feel the spirit of the forest, surrounded by a world of plants, mammals, birds, amphibians and reptiles. 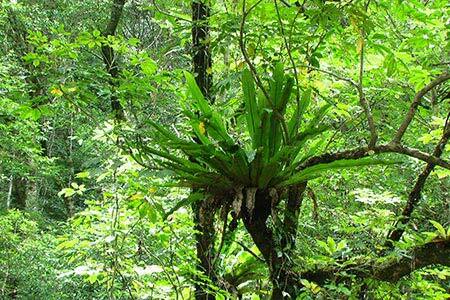 Professional eco-guides can help them find these creatures. 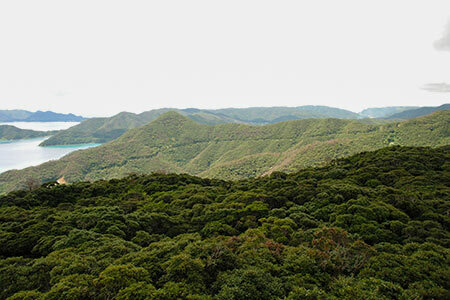 The trails in this forested park lead to several observation points, where visitors can take in extraordinary views of the East China Sea and the Pacific Ocean. 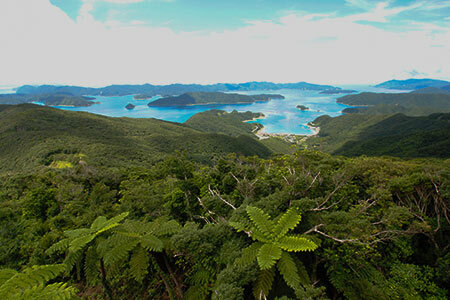 Along the path, they can see many subtropical plants, birds and mammals, maybe even glimpsing a rare Amami black rabbit. In January, Higan cherry trees start to bloom in the forest, their deep pink petals standing out dramatically against the rich green foliage. 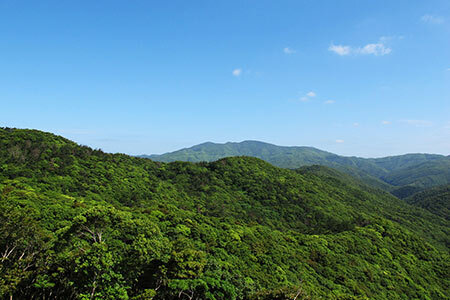 Yuwandake is Amami's tallest mountain, with an elevation of about 700 m, or 2300 ft. A dense subtropical forest covers the area, which is home to many endangered species, including the Amami black rabbit, Amami spiny rat and Lidth's jay. A variety of precious orchids can been seen blooming along the trail leading to the top of the mountain. 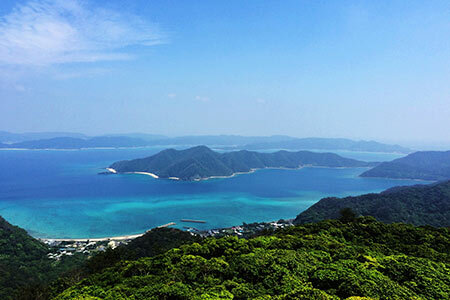 Because of its height, the top of Yuwandake is the only place in Amami where snow has ever fallen. 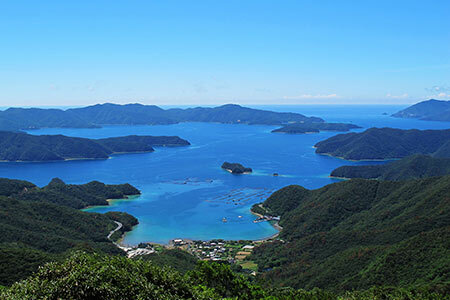 From the tops of these two mountains in southern Amami, visitors can enjoy panoramic views of the distant Oshima Channel. 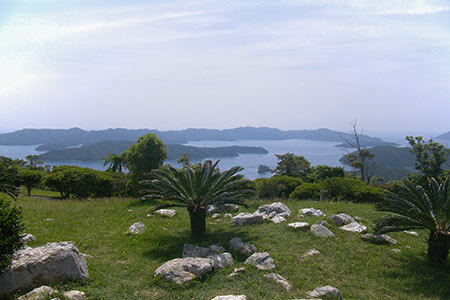 Each peak has an observation point, and additionally there is a small golf course. Around New Year's Day in the middle of winter, many people come to see the mountains covered with rosy cherry blossoms. Copyright (C) Amami International Network. All rights reserved.